Are you pursuing your dreams? Or are doubts keeping your feet stuck in the mud of disappointment? Dreams were easy when we were young, they didn’t have to something real. My oldest daughter wanted to be a fairy princess or a movie star, okay the movie star part could be real. My youngest wanted to talk to dolphins. Of course their dreams changed, morphed into others as they got older. My dream was to be a published author, to be able to go in to the bookstore and find my book on a shelf for sale. Part of that dream has come true. I am a multi-published ebook author. Doubt wrestled with me many times over the years. I started and stopped writing, and began and put aside many different stories. I believed I wasn’t good enough, didn’t have enough talent, that my stories were boring. Doubt and fear had me firmly in their grasp. But I didn’t give up! I finished a book, submitted it, and it was accepted. I had held on for the rocky ride and succeeded. It was amazing! When I think about everything that has happened since then I am so glad I didn’t give in to the doubt. From the acceptance letter, the first autograph requested, the first review, and the first fan mail. Truly a dream come true. 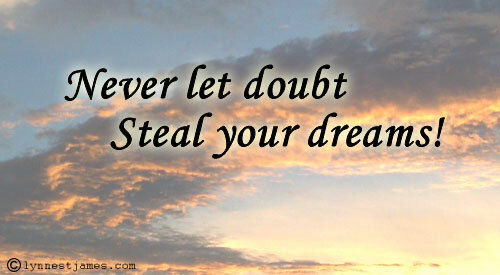 Dreams/doubts? What are you hoping for? Please share.